Mike Marsh was co-host at the George Poveromo Salt Water Sportsman Seminar Series held at New Bern on Jan. 16, 2010. Mike Marsh coaxed information about cobia fishing from Capt. Pete Zook of Energizer Sport Fishing Charters, Capt. Gary Dubiel of Speck Fever Guide Service and Capt. Charles Brown of Old Core Sound Guide Service. The format consists of George or Mike onstage with three other experts. Large screen monitors allow close-up viewing of speakers, tackle and lures, and maps showing their fishing hotspots to everyone in the audience. Even those in the back of the auditorium can easily see and hear all of this great fishing information. 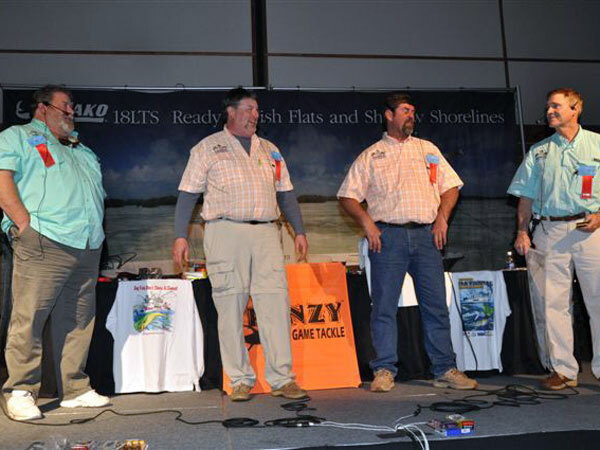 The New Bern Seminar was packed, with standing room only for more than 600 visitors, making it one of the most successful events in the 23-year history of the Salt Water Sportsman Seminar Series. Everyone had a great time, with lots of door prizes given away, including a Bahamas bonefishing trip. If you missed this year's event, be sure to check this website for the date of next year's event, which will probably be held in January, 2011. Swans wintered in large numbers at Pungo Lake and Lake Phelps, making the hunting excellent. However, the big birds get warier every year and many flocks veered away from the decoys. The trick is using camouflage face nets and sliding down as low in a ditch as possible. Shots can be long at these birds, which can weigh more than 18 pounds. Shot sizes should be BB steel or No. 2 Tungsten. Hunters should try to hit the head and neck for clean kills. A chase for a cripple can go on for a mile across soggy farm fields, until the bird falls into one of the deeper canals and can't climb out. A dog with lots of heart can chase down a swan and hold it by antagonizing it until the hunter can arrive to finish the fight. A really aggressive retriever can kill a swan and retrieve it. But a swan is capable of injuring an inexperienced retriever with blows from its wings. For archery hunts, better to leave the dog at home because there are typically lots of arrows sticking up in the ground and a downed swan may have an arrow protruduing. 15-year-old Nathan Garrett is the N.C. junior state champion mouth swan and goose caller and is the head guide at Wildfowler Lodge (910-233-0809) at Swan Quarter near Lake Mattamuskeet National Wildlife Refuge in Hyde County. Swans are covering Lake Mattamuskeet and the ducks are just arriving in great numbers. Garrett hunts impoundments with standing cornfields and has a good success rate. Lodging is first-class with fine food. My son, Justin, was home from UNC-Charlotte for Christmas break and, as we’ve done since he was old enough to sit in a duck blind, we hunted waterfowl. A highlight was a duck hunt at The Mill Pond Hunting Club near Whiteville. Our guide was Vinson Bowers, who had grown up in a glass-fronted home overlooking The Mill Pond. 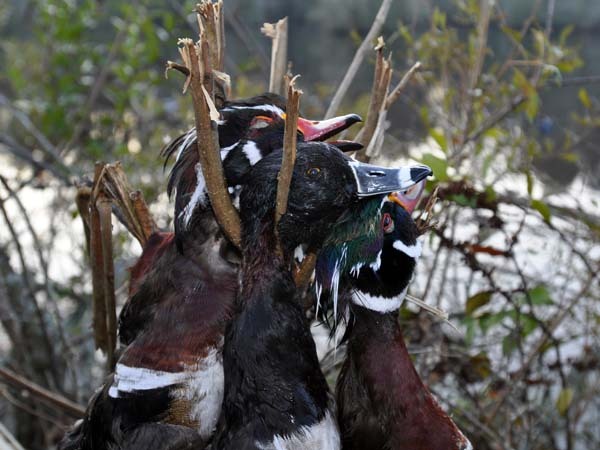 From a small aluminum boat, Bowers set out a dozen wood duck decoys in front of the blind on the 68-acre lake. But he also set out a pair of diving duck decoys. As the sunlight peeked through Spanish moss curtains draped among the ancient cypress and blackgum trees, wood ducks squealed in surrounding swamps. The rushing of wings announced a flock of wood ducks was decoying and two drakes fell to Justin’s shotgun fire flashing orange against the blackness of the pre-dawn. Ring-necked ducks are an anomaly among the group of ducks known as diving ducks. Diving ducks are capable of swimming down 40 feet or more beneath the surface to eat mollusks and submerged vegetation that puddle ducks, such as mallards and wood ducks cannot reach. Puddle ducks typically feed in water depths of 18 inches or less. Besides it’s unique bill ring the ringneck is identified by the russet collar around its neck. Daffy Duck, of cartoon fame, is a ring-necked duck, but poetic license allowed his creators to draw him with a white ring that is much easier to see than the ring on the neck of the real game bird. Ringnecks can be confused, even at shotgun range, with lesser or greater scaup and limits are much lower for scaup at two birds per day than for ringnecks at six per day. The characteristic that sets ringnecks apart is distinctive sound of their wings, which sound like jet streaking overhead accompanied by a high-pitched, pumping whistle. The Mill Pond was built by Capt. Valentine Richardson just after the Civil War and was used to power a gristmill. Jackson Brothers Lumber Company purchased it to power a steam-operated sawmill in 1925 and built a fishing cabin. The cabin became the Brunswick Walking and Drinking Club in 1928 and hosted many wealthy individuals who participated in the excellent quail hunting, including Ross Perot, Jesse Helms and Emile Du Pont. But when Lawrence and Julia Bowers purchased The Mill Pond, organized hunting ended in 1958. But their sons, Vincent and Larry, continued hunting ducks and fishing for bass. The original clubhouse is used for entertainment area. 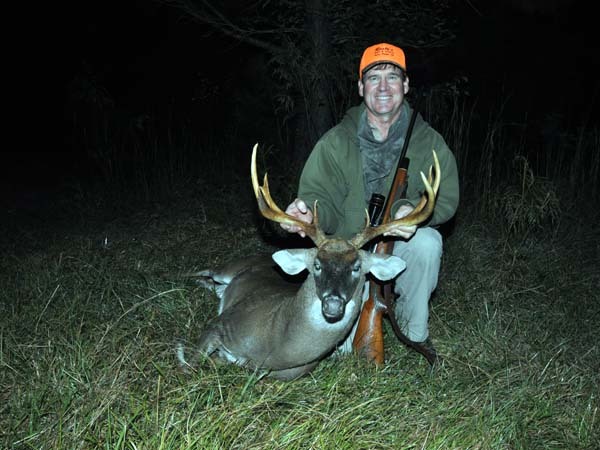 The Bowers’ home became a hunting club again when Rick Edwards and his son Richard acquired the property in 2006. The club has eight members, including Vinson Bowers. “We kept everything in its historic state as much as possible,” Rick Edwards said. “The cabin still has its original woodwork and poker table dating to the 1920s. Each member has his own bed in the Bowers’ house, which serves as the clubhouse. The sound of wings sound of wings ripping clouds caught Vinson Bowers’ attention. Ringnecks are super-fast ducks. As the pair buzzed The Mill Pond like bumblebees, one fell to Justin’s fun. The other flew on, missed by his dad. Our Lab, Tink, retrieved the drake ringneck. Added to wood ducks, the diving puddle duck was the perfect compliment to a bag of millpond waterfowl. I've been playing around with a couple of .17HMR rifles, one by Savage and this Mossberg International 817. This one is a tack driver, with some groups making one hole at 50 yards. It's a 100-yard squirrel gun, especially for the trophy of all small game, the southern fox squirrel. 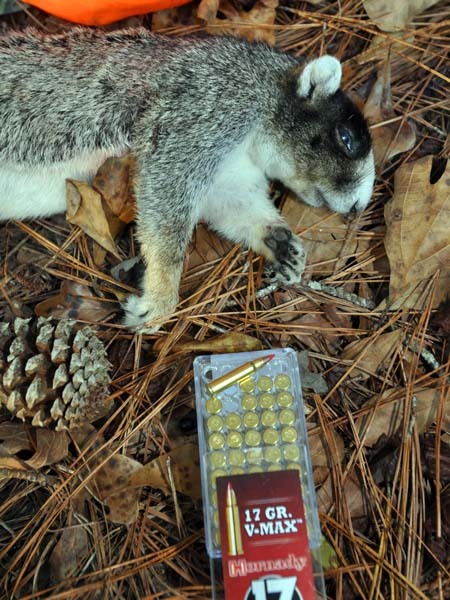 Shots in the longleaf stands where these beautiful and unique critters live can be very long and they are much larger than gray squirrels, making the .17HMR the perfect choice. This is a nice buck for southeastern North Carolina. The 4/12-year-old buck was scent-trailing a doe, about an hour behind her. Crossing a narrow opening, he offered me a fleeting shot at 175 yards - a good enough opportunity for a woods-worn Remington 700 in .30-06 caliber I've carried so long that shooting it feels like an extension of my thoughts. The handload consisted of 59.4 grains of IMR 4350 behind a Hornady Interlock 150-grain bullet. A broken right antler tip makes a less-than-perfect rack, but gives the buck character. "Luck" happens when preparation meets opportunity. I was simply in the right place at the right time. Mike Marsh shot this red squirrel or "boomer" near Mount Mitchell. It wasn't the greatest day for hunting, overcast and raining with lots of wind. That high up in the mountains, we were actually hunting in the rain clouds, which obscured the spectacular scenery and fall colors. 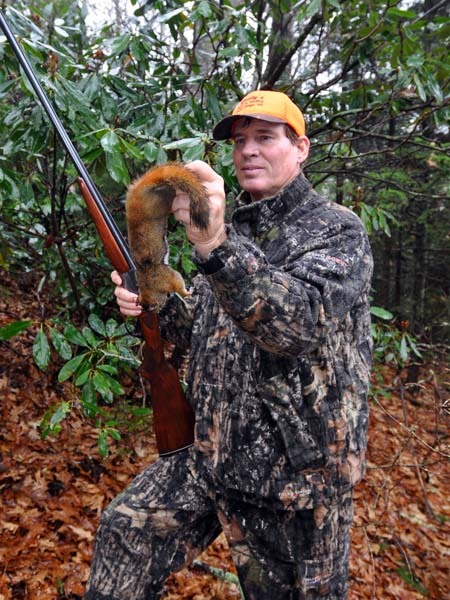 While I saw many red squirrels when I hunted deer and turkeys in the Appalachians when I was much younger, I had never taken a red squirrel. My trusty Savage side-by-side with 3-inch magnum shells loaded with No. 6 shot did the trick with this nice male. Although small, boomers are quite tasty. I missed a fox squirrel at a coastal game land earlier in the week and took a gray squirrel the same day. Had I not missed the fox squirrel, I would have completed the Carolina squirrel slam. I will keep trying for the fox squirrel. 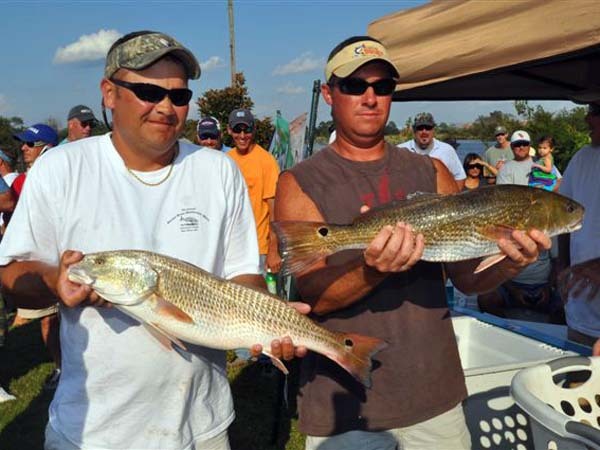 Brad Buck and Mark Dudley of New Bern set a new Neuse River Backwater Open record during the 7th annual event, which was held on Oct. 3,2009. The two-man team weighed in five speckled trout, two red drum, two flounder and two stripers weighing a total of 32.75 pounds. 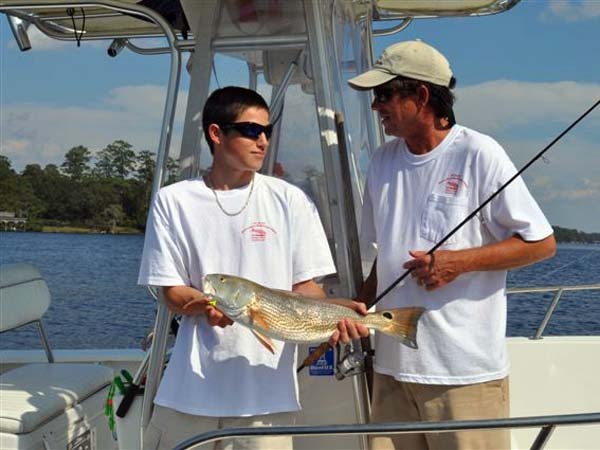 The anglers fish together several times per week and work the same shift at PCS phosphate. Essentially, they "practice fish" for the tournament all year long. Their expertise and experience paid off with the win. The team was using 4-inch Berkley Gulp Pogy lures fished on jig heads. They also used MirrOlures. The pair was fishing from a 22-foot Triton boat, equipped with a trolling motor and Power Pole, an anchoring device that lowers an arm to dig into the bottom, stopping the boat almost instantly when a pocket of fish is found. These two devices are revolutionizing tournament fishing in shallow water as much as depthfinders and GPS units have changed competition fishing in deep water conditions. 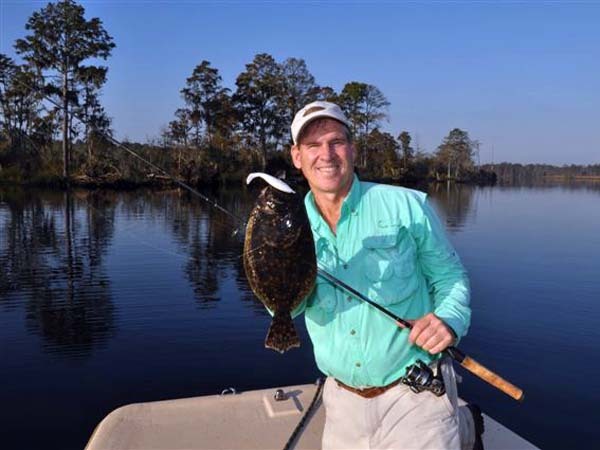 Larry Baldwin is the Lower Neuse Riverkeeper. 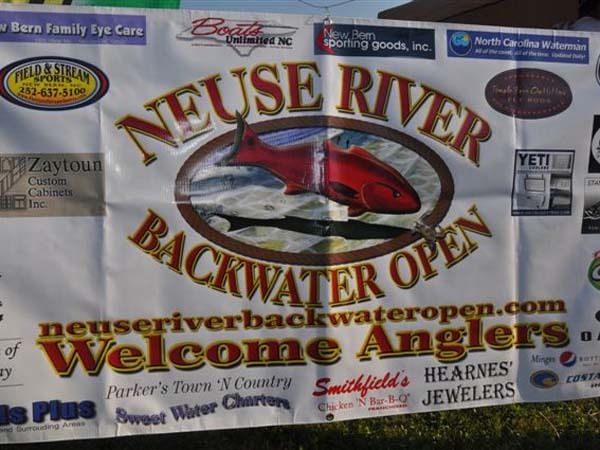 He was glad the tournament brings awareness to the Neuse Riverkeeper Foundation. Baldwin has been the Lower Neuse Riverkeeper for 7 years. He said awareness of the recreational value of the river is heightened by the tournament. He uses a 20-foot Wellcraft boat to patrol the river, searching actively for polluters. The foundation also tries to stop negative impacts to the river through education and legislation. Additional prizes were also awarded for first, second and third places. The total amount raised for the Neuse Riverkeeper Foundation was $1,500.